Scandinavia is the first region in the world to rely increasingly on battery-powered and thus environmentally-friendly technologies in the shipbuilding industry. After "Ampere", the world's first electrical ferry in Norway, and a follow-up order of the Finnish shipping company FinFerries, Siemens has now received an order from Norwegian ferry operator Fjord1. Ampere was put into operation in Norway in May 2015, and has traveled a distance equivalent to more than 1.5 times around the equator. With the change from diesel propulsion to battery, Norwegian ship owner Norled has reduced the cost of fuel by 60 percent. Now Siemens has tailor-made a suitable technical solution for Fjord1. With this contract, the first four battery-driven ferries in the world will run on technology developed and manufactured by Siemens. "Elektra" - the newest member of the electric ferry fleet: In June 2017, the Elektra began regular operation between Nauvo and Parainen in the Turku archipelago. Battery packs, which are charged via the land-based charging stations in the harbor for use by the ferry, serve as the primary source of energy, with Diesel engines used as emergency power units. The Elektra is also Europe's largest car ferry. At nearly 98 meters long and 16 meters wide, the Elektra can transport up to 90 cars per trip. The ferry purchased by FinFerries will now be traveling this route every 15 minutes. The batteries will be charged in roughly five minutes while cars move off and onto the ferry. The two lithium-ion batteries each have a capacity of 530 kWh. The world's first battery-powered work boat for fish farming has been brought into operation in Norway. The "Elfrida" electric boat is used off the coast of Central Norway by Salmar Farming AS, a Norwegian salmon farmer. Siemens developed and supplied the complete electrical propulsion and control system to the local shipbuilding company, Ørnli Slipp. The double-hulled boat is around 14 meters long and eight meters wide. It requires around 50 minutes for its daily trip to the fish hatchery, which lies twelve kilometers off the coast. One hundred percent battery operation is possible throughout a normal working day of about eight hours. Siemens will supply propulsion systems for two new battery ferries. The all-electric ferries operated by Fjord1 will ply the E39 Anda-Lote route on the west coast of Norway. Both will have a cargo capacity of 120 cars, twelve trailers and 349 passengers. 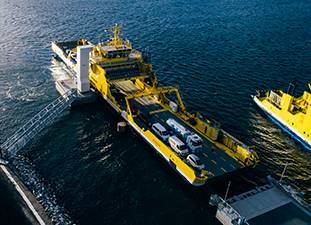 Siemens has been commissioned to provide the complete electro-technical solution for Finland's first battery-powered car ferry. The Finnish shipping company FinFerries has ordered the newbuilding from the Polish shipyard CRIST S.A. The environmentally-friendly ferry will improve the transport options between Nauvo and Parainen in the Turku Archipelago. It will be approximately 90 meters long by 16 meters wide with capacity for a maximum of 90 cars. Operation on the 1.6 kilometer-long route will begin in summer 2017. The world's first electrical car and passenger ferry powered by batteries has entered service in Norway. The ferry only uses 150 kilowatt hours (kWh) per route, which corresponds to three days use of electricity in a standard Norwegian household. Built in conjunction with shipbuilder Fjellstrand, Siemens put up charging stations with lithium-ion batteries which are charged from renewable energy, namely hydro power. With the change to battery, ship owner Norled is reducing the cost of fuel by up to 60 percent. 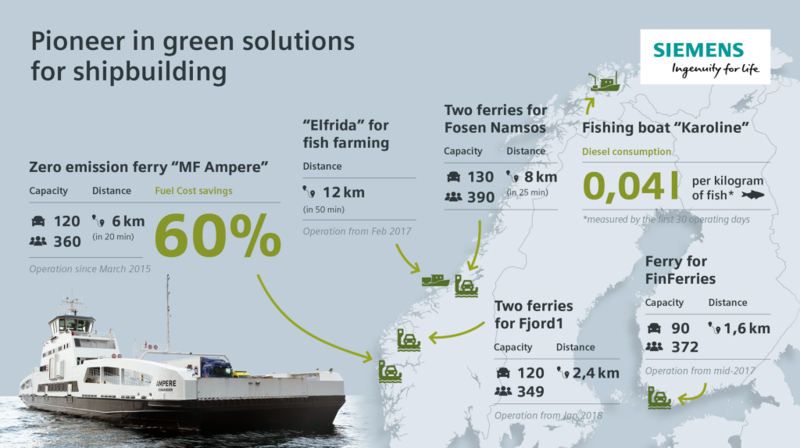 The Norled ferry represents a milestone on the road to operating completely emission-free ferries along Norway's long coastline, with at least 50 other routes currently able to sustain battery-operated vessels.